Next week starts our Club Championship Tournament. If you are not signed up to play and want to follow the field, please contact the Pro Shop. I have 18 ladies playing. I have three flights and willl be awarding seven players. One Overall Low Gross Champion of the field and a Low Gross winner and Low Net winner in each flight. Starting times willl be posted on Fore Tees by the Pro Shop. Starting times will begin at 8:30 am on each day of play, October 2nd, October 4th and final round October 9th. Pace of Play: The allotted time to play an 18 hole round in the Club Championship Tournament shall be no more than 4 3/4 hours. Score Cards: Players shall exchange Official scorecards within their foursome on the 1st Tee Box. Each player is responsible for the correct gross score by hole. USGA Rules apply: In stroke play, if a competitor is doubtful about their rights or the correct procedure during the play of a hole they may, without penalty, play a second ball under Rule 3-3. The score willl be recorded for both balls and the Committee willl decide which ball counts at the end of the round before the score card is signed. Yesterday Jon informed us that he willl be addressing some of the areas on the golf course with the Course Superintendent. I should have more information as to ground under repair before October 2nd. First day pairings willl be determined with the lowest to be the first off the tee. For Thursday October 4th, players willl be paired by their gross scores with the lowest totals playing together and following in succession. Flights and pairing willl be seeded by USGA handicap index. I will be using your October 1st handicap index. What a day, it would be faster to list the ladies that didn’t BEAT-THE-PRO that it would be those that did, but here goes… Congratulations to: Annette Krey, Dana Wardstrom, Mary Watkins, Shelly Morgan, Gay Wold, Sandy Smith, Jill Chase, Sue Howell, Donna Reich, Bonnie Ladd, Raquel Myers, Sondi Schnee, Janet Brown, Marti Fowler, Nonie Greenfield, Jan Baehr, Jan McCleery, Kay Gschwend, Donna Johnson, Carol Grabar, Anne Wangeman. Birdies, Sue Howell and Sandy Smith, both on hole #7. CONGRATULATIONS TO ALL OUR WINNERS AND THANKS FOR PARTICIPATING TO ALL OUR LADIES WHO PLAYED. The following ladies are signed up to play BEAT THE PRO next Tuesday, September 25th. We will be playing Monica on the front nine and Jon on the back nine. The maximum bet will be $20 (cash only please). The amount of your bet will be put in your account as a credit, and it will be matched if you BEAT THE PRO. Please arrive early enough to make your bets in the Pro Shop, and register upstairs before 8:00 am. Sweeps – $2 billed directly to your account. If you would like to be added to the player’s list, please email me before Sunday afternoon (2pm). REMINDER: THE GENERAL MEMBERSHIP MEETING WILL FOLLOW PLAY. WE WILL BE ELECTING OUR OFFICERS FOR NEXT YEAR AS WELL AS VOTING ON THE BY-LAWS UPDATES, CHARITY SPENDING, AND USE OF RESERVES TO PAY FOR THE HOLIDAY LUNCHEON. If you cannot make the General Membership Meeting, please remember to submit an absentee ballot (available in the 18 Holers Drawer in the Pro Shop). Thanks all for your participation. Please be sure to sign up for the 2012 Ladies Club ChampionTournament. Sign up sheet is posted on the bulletin board in Pro Shop. The cost is $25.00. There will be awards for low gross and low net/ nets in each flight depending on the amount of players as well as the overall low gross. Hi Ladies. Here’s a great article about the Rules, enjoy. The original Rules of Golf issued by the Honorable Company of Edinburgh Golfers in 1744 numbered just 13. Today’s Rules of Golf has 34 Rules with over 200 sections and subsections, totaling more than 20,000 words. It is no wonder that most golfers never bother to read the Rules book at all and that even acknowledged experts will often disagree over the interpretation of some Rules. If all golfers were to learn these 10 Golden Rules below it is estimated that they would be able to resolve 90% of the Rules situations that golfers routinely encounter in the course of an 18-hole round. 2. Don’t move, bend, or break anything growing or fixed, except in fairly taking your stance or swing. Don’t press anything down. 3. You may lift natural objects not fixed or growing, except in a water hazard or bunker. No penalty. 4. Movable man-made objects may be moved. For immovable objects, you may take relief by dropping away from them within one club-length of the nearest point of relief, no nearer the hole, except in a water hazard or if the object defines out of bounds. In a bunker, you must drop in the bunker. No penalty. 5. You may take relief from casual water, ground under repair, burrowing animal holes or casts, anywhere except in a water hazard. 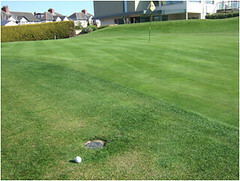 On the putting green, place at the nearest point of relief, no nearer the hole;otherwise drop within one club-length of the nearest point of relief, no nearer the hole. In a bunker, you must drop in the bunker. No penalty. 6. In a water hazard or bunker, don’t touch the water or ground with your hand or club before the stroke. 7. If you hit your ball into a water hazard and cannot find or play it, either drop behind the point where the ball last crossed the hazard margin or at the place where you played the shot. On the tee, you may tee the ball. One penalty stroke. If you hit into a lateral hazard, you may also drop within two club-lengths of the point where the ball last crossed the hazard margin, or, within two club-lengths of a point equidistant from the hole on the opposite margin. One penalty stroke. 8. When you hit your ball out of bounds or cannot find it after 5 minutes of searching, add a penalty stroke, go back and drop a ball at the place where you played the shot. On the tee, you may tee the ball.If you think you have hit your ball out of bounds or lost it outside a water hazard, play a provisional ball before searching for the first one. 9. When you have an unplayable lie, you may drop a ball at the place where you played the previous shot, adding a penalty stroke. On the tee, you may tee the ball. Alternatively, drop within two club-lengths, no nearer the hole, or any distance behind the unplayable spot, keeping it between you and the hole. If the ball is in a bunker, you must drop in the bunker, under either of the alternative options. 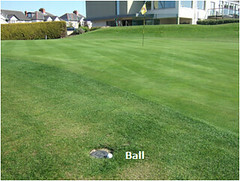 If you can’t play your ball that is in a water hazard, see Golden Rule #7. Repairing the lip of a hole………the Rule! This is a recent communication from a Rules website. As this is a common occurence on our course I though you might all be interested. When do the Rules of Golf permit a player to repair the damaged lip of a hole? The answer to this question may not be quite as simple as it sounds. Decision 16-1a/5 confirms that if a player touches the inside of a hole they are considered to have touched their line of putt in breach of Rule 16-1a, unless they are doing so to repair damage that was clearly made by a ball, as in the photo above. 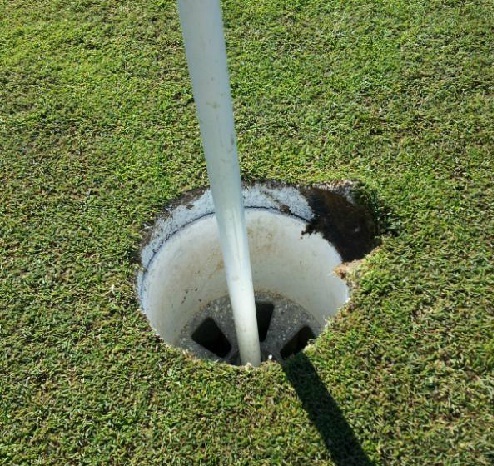 So, if the damage to the lip of the hole was made by a flagstick, due to strong winds or having been replaced in the hole sloppily, a player may not repair the damage before making their stroke. Q. Prior to putting, a player discovers that the hole has been damaged. What is the proper procedure? (a) If the damage is such that the proper dimensions of the hole have not been changed materially, the player should continue play without repairing the hole. If he touches the hole in such circumstances, a breach of Rule 16-1a occurs. (b) If the proper dimensions of the hole have been changed materially, the player should request the Committee to have the hole repaired. If a member of the Committee is not readily available, the player may repair the damage, without penalty. It is recommended that players should only repair flagstick damage to the edge of a hole after all players in the group or match have completed play of the hole, similar to caring for the course by repairing spike marks near the hole as all players are leaving the putting green. The reason for this is that if the smoothing of any ragged edge to the hole is in any way intended to influence the movement of an opponent’s, fellow-competitor’s or partner’s ball the player incurs a penalty of two strokes for breaching Rule 1-2.